Now let’s have a look at the black rhinoceros which, after the elephant, is next in line in the human-created African icon ranking. After elephants, I know the black rhinoceros perhaps better than any other of Africa’s wild animals. I spent seven long dry seasons of my life (1964 – 1970) pioneering their capture in Rhodesia (now Zimbabwe). During that time, I caught 140 of these large and cantankerous animals – in tribal trust lands where they were being killed by rural village hunters for meat (in those days) – and I moved them into safe havens in the national parks. I doubt that anybody knows the black rhino quite so intimately as I do. My university thesis was entitled: “FACTORS AFFECTING THE DISTRIBUTION AND SURVIVAL OF THE BLACK RHINOCEROS IN RHODESIA”. The Black Rhinoceros is a solitary and essentially nocturnal animal. It wanders great distances (within its relatively small home-range) every night, drinking water, feeding off (green and bone dry) forbs, and green tree twigs and leaves. It bites off small branches as thick as a man’s fingers and chews them, in their entirety, into tiny wood chips – swallowing them all. Sometime during the first hour after dawn, the rhino – all on its own – retires to heavy thicket vegetation inside which it selects a safe place to sleep. And there, until three or four o’clock in the afternoon, the rhino lies doggo and soundly sleeps the day away. It ventures outside the thicket in the late afternoon and, come dusk, it begins once again its nocturnal perambulations. In the 1960s, in the Zambezi Valley, the thickets the rhinos preferred to sleep in, comprised a plant species called Combretum eleagnoides – which black rhinos don’t eat. In Zululand, South Africa, the black rhino adopts exactly the same 24 hour behaviour pattern, also retiring to sleep in thicket during the day. In Zululand, however, the thicket comprises a plant called Acacia karoo – which is one of the black rhino’s favourite foods. 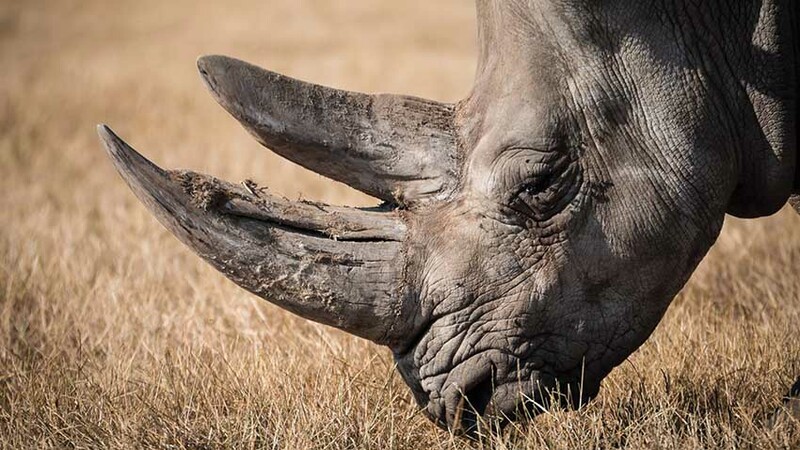 In Zululand, therefore, the game rangers came to the conclusion that black rhinos retire into Acacia karoo thickets because that species of tree is what they eat. The rangers also noted, however, that the Zululand rhinos did not eat inside the thicket during the day. They went into the thicket during the day purely to sleep. The conclusion drawn in Zululand was NOT valid; and because Rhodesian black rhinos retired to thickets that were never eaten by them, I concluded there must be another reason for them using thicket as a day time retreat so assiduously. It didn’t need a rocket scientist to determine the reason. Black rhinos use thicket to hide away from the general hustle and bustle of other wildlife activities surrounding them during the day; to hide away from man and other predators; and in which to sleep – and they sleep soundly for most of the daylight hours because they are up all night long foraging. During my seven years catching black rhinos, I had noticed that the greatest rhino population densities occurred in habitats containing the heaviest and most extensive thickets. They sometimes lived in very broken country with light vegetation – even in quite open country – but then they were always in very low numbers. So (in 1964/65) I selected three very different habitats – containing very thick; medium; and very light vegetation cover, respectively – and I mapped out the extent to which individual rhinos in each population used their habitats. We knew exactly how many rhinos lived in those habitats because we captured them all. I then measured the area-coverage of three different vegetation-types in all three study areas – with a pantograph; and I calculated (photographically) a lateral cover measurement for each vegetation type. This gave the cover measurements a third dimension! When I compared the results, I obtained a 99 percent correlation coefficient between the three-dimensional cover factors in the thicket components of the three study areas – relative to their respective rhino population numbers. This proved there was a definite and measurable relationship between the available cover in black rhino habitats, and the size (or density) of the populations that occupied them. In a nutshell: The greater the three-dimensional thicket cover, the more rhinos the habitat is able to support; and the habitats with the least cover carried much fewer rhinos. Why should this be? Simple! Because there is greater day-time security – for sleeping black rhinos – in thick cover, than is the case in habitats with only limited cover. This seems not to have anything to do with availability of food – which we did NOT attempt to measure – but, obviously, the availability of an adequate food supply was an additional and conditional factor. Rhinos satisfy all their food requirements when foraging, right out in the open, during the hours of darkness. Linked to this observation was the fact that, at the height of the dry season, no rhino anywhere in the dry Zambezi Valley ventured more than 5 kilometres (3 miles) from permanent water. In dry and hot areas, black rhinos ‘sweat like pigs’ and they are distressed if they do not have daily access to water. an abundance of very succulent Euphorbia plants! So there are three important habitat factors that determine black rhino occurrence, that decide population density, and that contribute to their survival. They need: a reliable water supply that is no more than 5 kilometres from the outer perimeters of their dry-season home ranges; a good deal of thick cover (for security) into which they can secrete themselves during the day – to sleep; and an adequate supply of edible plant foods. In habitats that have been stripped naked by excessive numbers of elephants over a long period of time, NONE of these habitat resources now exist within 5 kilometres of permanent water. There is one other thing that still needs to be added to this conundrum. When a black rhino cow has a new calf – which happens approximately every 30 months – she forcibly rejects her previous calf; and she moves out of her established home range to become a wanderer. She does this to ruthlessly break the bond with her previous calf (which stays behind in her old home range area – looking for her) and to better ‘hide’ her new calf from predators (especially hyenas). Her movements then have no routine! For the first six months of her new baby’s life, every night she hides it away (in thick bush) up to two kilometres from the water. She then goes down to the water by herself and leaves her baby hidden away, and all alone, during her absence. (This behaviour is not yet known to science.) She does this because it is at the waterholes where lions and hyenas lurk at night. If she brought her baby down to the same waterhole every night – or at frequent intervals – therefore, sooner or later she would be handing it to these voracious predators – on a plate. Being solitary animals, black rhino cows have great difficulty protecting their babies from packs of marauding hyenas at night; and (unbeknown to most people) hyenas represent the biggest killers of black rhinos – that is, of baby black rhinos! And when there is no cover to hide her baby away at night – as occurs in areas where excessive numbers of elephants have cleared away all the heavy vegetation within 25 kilometres of water – baby black rhinos become very vulnerable when left alone, and exposed, when their mothers goes down to the waterhole to drink. In fact, it is doubtful that any would survive such a state of affairs. There exists, therefore, a massive clash of ‘conservation’ objectives between those people who want to let elephants multiply without constraint (because they don’t have the guts to say “shoot them”) and those scientists and wildlife managers who want to ensure that our shrinking black rhino populations are managed in the best possible manner – and in the best interests of the species’ survival. It is clear that in countries like Botswana – where the elephants have removed ALL the (security) cover, and ALL the black rhino’s dry season food plants, for up to 25 kilometres from ALL surface water – there is no habitat left AT ALL (within 5 kilometres of water) that can possibly support a black rhino population. Those ignorant animal rightist NGOs, those pseudo-scientists who are fellow-travellers of the animal rights brigade, and those other people who simply cannot countenance the idea of an elephant being killed, have no idea that these contradictory ecological circumstances prevail. Yet there is no doubt that, even where there was once a vibrant population of black rhinos living in a healthy habitat, if the elephant population that shares that habitat is allowed to breed without constraint, they will render the black rhino locally extinct. And there would be no point – after that fact – in re-introducing a new breeding nucleus of black rhinos because they will all die! This exemplifies just why it is so dangerous for Africa’s wildlife to have so-called NGO ‘experts’ in the First World telling us experienced African wildlife managers, how to manage our elephants and our rhinos – or any other wildlife for that matter. These people have no ecological training or practical experience about wildlife management in Africa; and they are constantly encouraging and brainwashing the emotional First World media, into continually drenching the public’s mind with animal rights propaganda. The animal rightist NGOs – and their foot soldiers – live in a fool’s paradise. Some of them may be educated but they are still ignorant, and they are outspoken in the extreme. You can’t teach them anything because they believe they know everything. The tragedy of these circumstances is that these pernicious people are creating the exact set of conditions that will ensure the black rhino becomes extinct without even a single poacher’s bullet being fired! 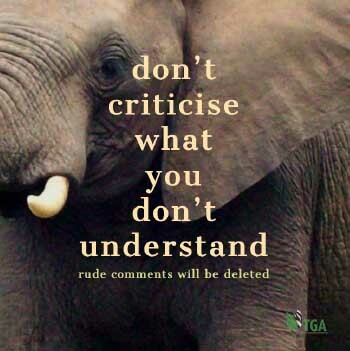 In the face of such crass stupidity, all I can say is: God help Africa’s wildlife!